I apologize for not writing more often. I know you all are praying and I thank you. Edie has done well to pass on information about the activities of the week so I will try not to be redundant. Monday last week, Luke and I went to Ishinomaki to pick up Dan after his two days of working in the Watanoha shelter assessing people's medical needs. While waiting for Dan, Luke and I walked around the devastated community with trash lined streets and many dilapidated houses. On our walk we were greeted in English by a man on his bicycle saying, "Thank you for coming. You Americans have been so helpful, Thank you." Our conversation continued and we learned that his father could use some help cleaning out his store. We exchanged calling cards and the following day Luke and Dan went up to meet the family and begin helping with the clean-up. My Tuesday was filled with meeting two different groups of people seeking information of how they could help the churches in the area and to bring the hope of Christ to people in the shelters. That afternoon three Koreans with Kosin Church ties went with me to the south to the village of Yamamoto Cho. Only 300 of the 1200 houses were left habitable in that farming community. Much of the farm land has been laid waste by the salt waters and the appraisal for the future seemed very bleak. Two men who had been baptized in December by Rev. Hayashi are zealous to build a gospel center in front of the station on property one of them owns. They are eager to make plans and move forward, so much wisdom is needed to determine how best to proceed. Farmers whose lives are tied to the land have little to look forward to in the immediate future. Nobody had tsunami insurance; very few had earthquake insurance and no houses were destroyed by fire. The people in this community will have to depend upon outside resources. Without homes to go back to hundreds of people are still living in schools acting as shelters and school is about to begin. On Wednesday I joined Luke and Dan to continue cleaning up the Takahashi store in Ishinomaki. It happens to be the oldest vegetable and fruit store in the city. At the end of the long day of cleaning Mr. Takahashi stood in front of his store and turned to me and said, "Thank you." I was privileged to pray with him and to ask God to be merciful to him and his family. Again he said, "Thank you." We all were invited for dinner provided by the Takahashis. Those with so little wanted to share what they had with us. We were able to pray with them again that they might know the grace of God, and the peace of God which surpasses all understanding. Rumble, rumble, BAM!!! we were hit again by a violent earthquake at 11:52. Someone said this was the bad aftershock that they had been predicting since the 3/11. Providentially Luke, Dan, and Yoko had left about three hours earlier, so Dan and Yoko would be able to fly out on Friday as scheduled. But for me I was left alone to pick up again. Not quite as much was strewn about as before, but my study once again was/is a mountain of books. Electricity was off until 7:20 am Friday. I am getting to meet our neighbors at all different hours of the night and day. I was sick Friday and Saturday and could not venture too far. It gave me time to prepare for the Lord’s day. Where is Dr. Dan when I need him?!? Even though we have not prayed for an earthquake per se, God is providing many new opportunities to share the Hope that is in Christ in the aftermath of this disaster. Leaders in the shelters are saying that the people need the "healing of the heart." Despite the fact that they have not allowed Bibles to be delivered to the shelters, we have been welcomed to talk with people and share the hope of Christ. People are returning to their neighborhoods despite no gas or running water saying, "Shelter life is full of too many disruptions. I want my own space." Now is a time of great opportunity for the Gospel. Pray for wisdom to be good stewards of the Gospel. Pray for boldness. Pray that we will be as wise as serpents and harmless as doves. Pray that the churches here will be filled with people seeking and finding the Lord. Pray for wisdom to know where to put our energies. Many people are asking to help. May God put us to good use for His glory. Pray for wisdom as we pursue how best to work with the RCJ to rebuild buildings, rejuvenate churches, and share the Gospel with the lost. 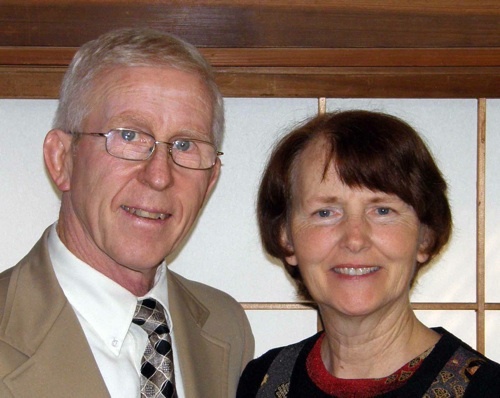 Again thank you for your prayers and financial support to meet the needs for the Gospel in Japan. After writing many of you individually about the situation here, I'm going to try a mass letter of how a week looks for us. This is Monday, so I'll begin with Monday of last week. If Kaz has a "day off" it is usually Monday. I go shopping while he does various clerical errands, such as depositing Sunday's collection, going to the post office, etc. Since the earthquake, we also go shopping for items needed at the Sports Center, which is being used as the evacuee shelter for people coming from Fukushima where the nuclear reactors are: baby and adult diapers, hand sanitizers, underwear for children and adults, etc. Once he bought 34 pairs of athletic shoes, and this week he bought 40 more! We found a store that allowed purchasing of cases of ramen (most stores allow only three or four packages per customer), so we each bought 5 cases. When we took the things to the shelter, we were told they had no specific needs at that time, so we sent several cases to Pastor Fujimoto in Hachinohe on the Pacific coast. His church is still standing, but there are many people in trouble around him. Every few days Kaz checks on the needs at the shelter, goes out to buy stuff, and delivers it. He is becoming a familiar face out there, so we have hopes that relationships will develop. Of course, he is not allowed to visit the living area of the evacuees (downstairs on the gym floor), or take pictures, but the staff appreciate his coming as representative of God’s people. He signs a book saying the donations are from the Yamagata Reformed Church which was given funds by their brothers and sisters in America. Our church members also make deliveries and feel so blessed to be able to minister this way. Many, many people want to help but don't know how. Thank you for supporting this effort. Tuesday. First thing I took the can and bottle trash to the designated shed by the park. Since the earthquake there has been no garbage pick-up (except raw), so it was beginning to pile up here. I had my regular English classes; Kaz went to work at the church after delivering more things to the shelter. One of my classes was for high school girls, who just graduated. One of them has gone to Tokyo to college; the other will be going to college in Sendai. She will have no entrance ceremony because of the earthquake and tsunami. It is a very important milestone in Japanese school life; more important than graduation even. Most schools in the Tohoku from elementary through college have canceled those ceremonies. (I'm sure that will become a story families will tell for years to come.) By the way, this girl and her mother were visiting me March 11, when the disaster struck. Wednesday. Many of you have asked about aftershocks. We feel them all day long, as many as 80 one day! Some are mild (magnitude 4) and we have to look at some hanging object like a light pull cord or a plant to check if it is really a tremor or only our imagination. But others (magnitude 7) are strong enough to set off the cell phone’s siren, or knock things over. I feel so sorry for the people on the coast who have to experience terrible fears over and over. We had our church women’s Bible Study in the morning, but my afternoon student who works at a medical center said she would be too busy to have a class this month. Another lady, who has a dental clinic with her husband, said he had had to go to the coast to aid in identification of bodies that had been found. He was very upset when he came home. 700 bodies were laid out all down the street for the doctors and dentists to examine and take samples from. Thursday. 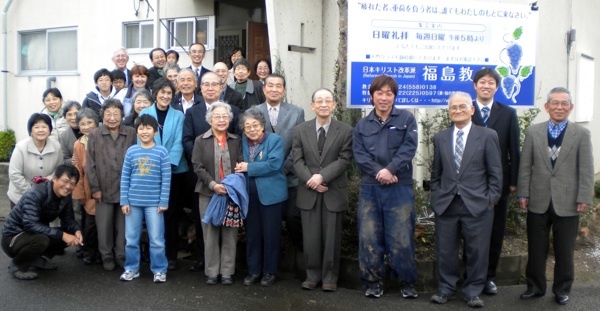 Baptism class for the Inoues was canceled so Kaz could go to Sendai for a meeting between the Reformed Church of Japan's Relief Committee and the OPC Japan Mission to map out a strategy for caring for the church and community's immediate and future needs. Our son David, in Japan on business, came to Yamagata for two nights. He was anxious to view the devastation first hand, so Kaz decided the next day would be a good chance to visit the Shiratsus, an RCJ pastor's family, who had had to take shelter in a school on March 11. I checked our pantry and packed two boxes of food and towels and anything else I could think of for them to take over there. Then that night we had another big aftershock around midnight. I had gone to bed, so David ran upstairs to bring me down. As soon as he got to my room, the electricity went off, but by the time we got to the bottom of the stairs the quaking was slowing down. We didn't have to go outside. We found enough flashlights to check around for damage (none), then I went back to bed. The electricity was off for nine hours. Friday. Mr. Shiratsu, first thing in the morning, called to tell Kaz there was so much confusion and disturbance over there after the earthquake the night before, he didn't think Kaz and David should go visit them as planned. However, Kaz and David set out with the boxes of goods, stopping along the way to buy more food and water to take. The roads were not as bad as they expected, so they were able to get all the way to the Shiratsus’. The church/manse was badly damaged by the tsunami, but the family had decided to leave the shelter, and sort of camp out on the second floor of their house ("there's no place like home!"). By the time our boys got there, though, the Shiratsus had gotten a ride to their daughter’s apartment, so Kaz and David didn't get to see them after all. They left the boxes and came home. Meanwhile, I had my regular gathering in the morning, hearing that another friend is returning to America. The radiation problem has many foreigners running scared. In the evening, a family that come for English, were telling about their experience Thursday night. The dad rushed into his five-year-old’s room to take him outside. I told him, "Just wait 30 years and he will be the one to rescue you!" Saturday. Not much to report. Two weeks ago, I took Kaz out for a lovely 39th anniversary meal. The restaurant where we often celebrate was closed for dinner, because of the difficulty in getting food and the lack of gasoline for people to get there. So we had a nice lunch! Now the stores are all open, but the menus are still limited. David left for Tokyo by plane, because the trains are not able to go all the way yet. The factory where spare parts are made was destroyed in the tsunami. There's no telling when the trains will be back up to speed. Sunday. (Are you still with me?) A former church member visited us at morning worship. She is a midwife and had come to the Tohoku to offer her assistance in the disaster area. She said she went to several shelters, looking for mother’s and/or babies whom she could help, but no one needed her! Apparently, relatives or neighbors had taken in all the infants. Our friend was quite surprised because she had heard there were many babies left orphaned. Since she couldn’t practice her profession, she helped clear debris! In the afternoon, Kaz and I went to Fukushima as usual on the 2nd Sunday. We saw many houses with the tile roofs partially blown off. The neighborhood around the church has nine houses, six of which are damaged and empty, one has already been razed and only the lot is left. The little church, the house next door and the house across the narrow street are all that are left. It felt a little eerie. I hope you will keep Japan in your prayers. Especially pray that people who lost loved ones will believe in the God of all comfort (2 Cor. 1:3), that those who lost their homes will find the shelter of rest in Jesus (Isa. 25:4), and that those whose hearts are broken will come to the Savior who loves them (Matt. 11:30, Isa. 1:1). Please continue to keep our missionaries and the brothers and sisters in Christ in your prayers.